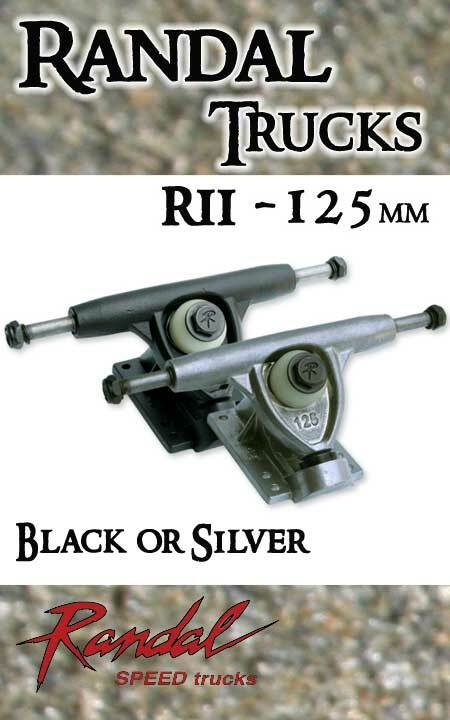 Randal -- the pioneer of the downhill truck market has added a slimmer width 125mm truck to it's legendary line up! Suitable for carving tight turns on minis, retros, slalom and surf skates! Made in the USA. Each truck sold individually. Offered in two finishes - silver (35d or 42d baseplate) or black (42d baseplate only). Choose color/baseplate degree when ordering. BUSHINGS: Reflex or Venom Bushings upgrade available. Choose option when ordering and specify any duro preferences in Notes section. MOUNTING HARDWARE: Your choice of 1.25", 1.75", 2.50" - 10/32 bolts with nuts -- sold in sets of 4 enough for one truck. Want to mix for wedging needs? Just select one size when ordering and provide detail in the NOTES section for this item.